Plan your strategy and let it work for you, on Binance and many others. Coirule has one main objective, we want to make your trading activity more effective and easier. Cryptocurrency markets operate 24/7, only an automated trading bot can fully manage any possible opportunity that will happen in the market movements. How to start a trading rule for DOGE with Coinrule? Set your automatic strategies using the If-This-Then-That style, no coding skills required! In a unified control panel connected to Binance, you will see all relevant info regarding your automatic trades. You can easily handle them, stop and run them at any time so you have absolute control of your crypto strategy builder. Coinrule's monitoring systems are designed for maximum control. We will never ask for Binance withdrawal rights. Your API Key is held with superior security outside our servers. 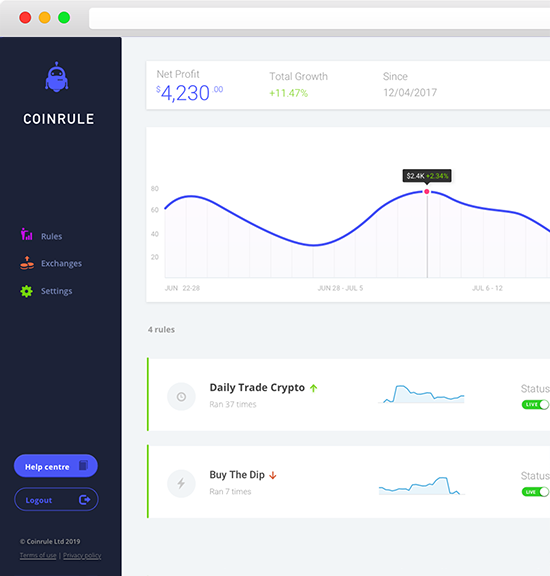 Trade with Coinrule on Account, in a safe environment. We want to offer a server that stands the highest standards. we are in touch with our most advanced userss to upgrade our product daily. Get in touch with us and book a One-to-One unique trading session! Receive free trading signals, buildstrategies and manage your portfolio for 30 days for free.